Pop-up habitats incentivize short-term conservation practices that are only needed during a critical window of time, such as a migration or breeding period. Through a pilot program led by The Nature Conservancy in 2014, early efforts to implement the concept have focused on providing temporary wetland habitat for migratory birds — as wetland habitats have been severely reduced at key points along migration routes. Pop-up habitats may be more cost- efficient than permanent conservation efforts since they do not require the permanent acquisition of land rights. In many areas, migratory birds have lost crucial stopovers as their migratory paths have become interlaced with intensive agriculture and urban development. Pop-up habitats help mitigate these impacts. BirdReturns, a project created and funded by The Nature Conservancy (TNC), is establishing pop-up habitats in rice fields in the Central Valley of California to support migratory birds and local agricultural operations. In this program, established in 2014, rice farmers were paid by TNC to keep their fields flooded for several weeks during the window when the birds traditionally arrive during their migration. The payments received by farmers were determined by reverse auction, in which the lowest bidders won the lease. In the first year of operation, 10,000 acres on 40 farms in the Central Valley were flooded for either four, six, or eight weeks. Preliminary observations of flooding showed positive results; in the first year of operation, flooded fields attracted three times the number of shorebird species, and had a density of shorebirds five times greater than in nearby non-participating fields. In addition, farmers who participated in BirdReturns had positive reflections on the process. The program allowed them to implement conservation practices on their land in a way that worked with their operation, and with sufficient compensation to make their involvement worth their while. A collaborative partnership among Mass Audubon, Audubon Vermont, Audubon Connecticut, and New Hampshire Audubon has taken a similar approach to bird conservation with a pop-up habitat program called The Bobolink Project. 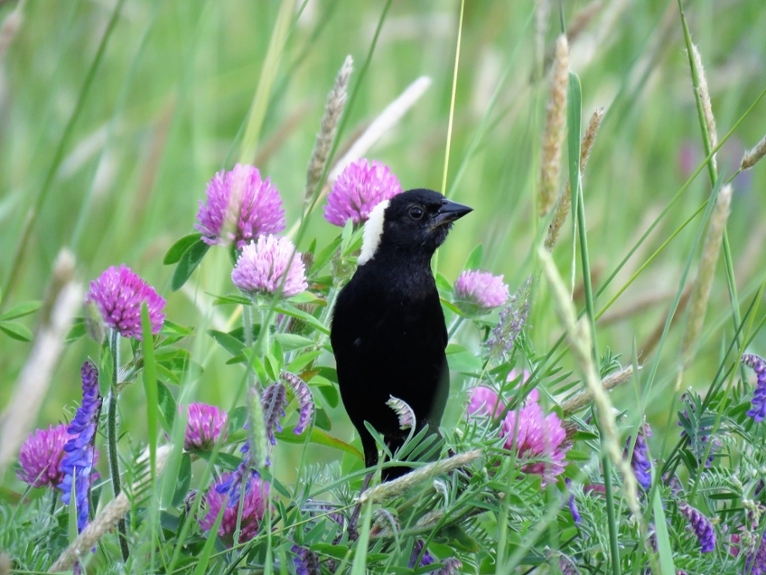 In this program, private donations compensate farmers who delay mowing schedules to provide nesting habitat for Bobolinks, a declining bird species. This conservation approach is a useful tool to incentivize farmers to alter the timing of agricultural operations to achieve impactful conservation outcomes. "In the first year of operation, flooded fields attracted three times the number of shorebird species, and had a density of shorebirds five times greater than in nearby non-participating fields." A mature male Bobolink perched among flowers. Photo: Allan Strong. Reynolds et al. (2017). Dynamic conservation for migratory species. Science Advances, 3(8), e1700707.